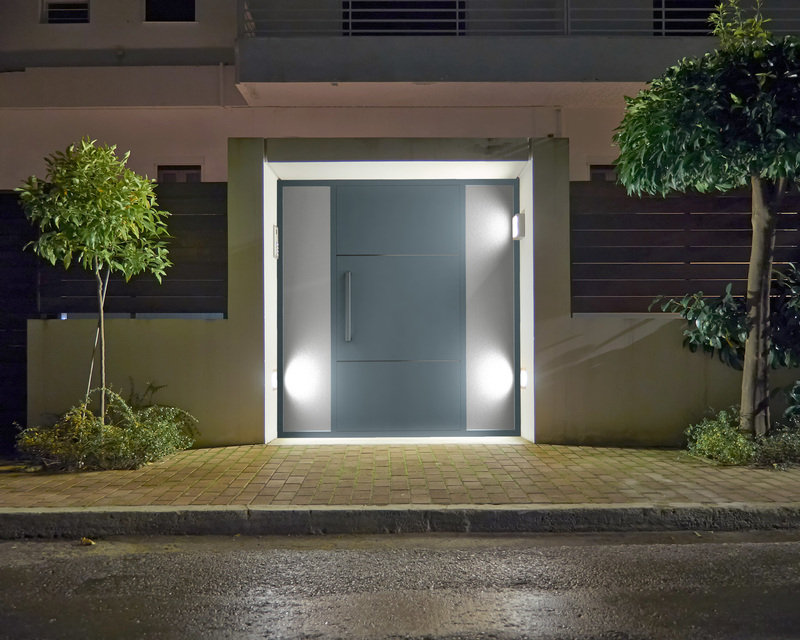 Why aluminum door is better than wooden or steel door? Making decision on purchase of the entrance door to the house, one should consider that their function has changed over the years. The most important task is still providing protection for the inside part of the house against unauthorized persons and cold. However, door is at present the visiting card of our house that is why it is very important that they integrate with the facade and windows. Constructing the house, we may select between wooden, steel, or aluminum door. The latter one has many qualities, which we may not be aware of when making the purchase. Wooden door – regardless of their elegant appearance, are characterized by quite large susceptibility to unfavourable atmospheric conditions. At least twice a year – during autumn and winter – their condition needs to be inspected, painting this kind of door periodically cannot be forgotten, and it has to be repeated every 4 to 8 years depending on whether the door is covered by transparent or opaque paint. 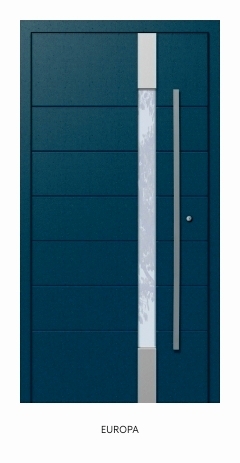 On the other hand, steel door may lose colour when exposed to strong sunlight. Aluminium door does not require frequent maintenance or painting, such door maintain the colour for many years and is not susceptible to humidity. 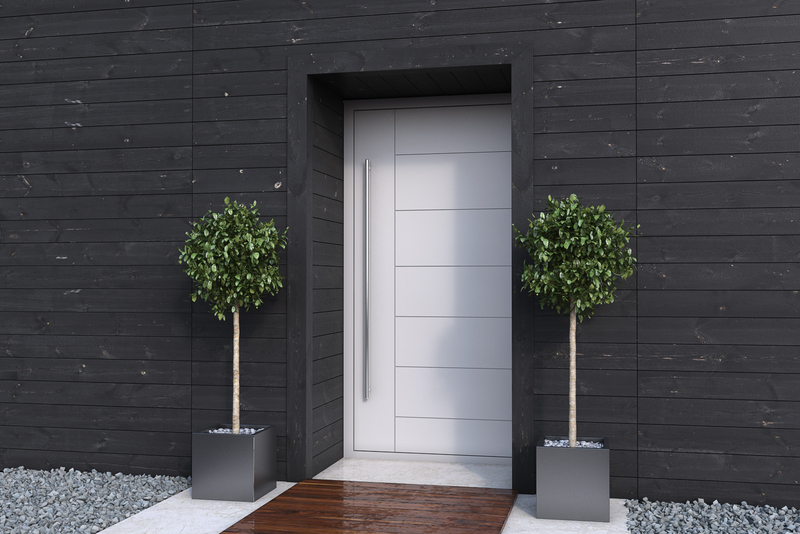 It is common that distributors of wooden and steel door recommend construction of the roofing, which is to protect the product against humidity and sun. Wood exposed to high temperature expands and deforms, whilst steel expand and distort. Similar impact on these materials, causing change in the leaf shape, has humidity. Additionally, humidity may lead to wooden door decaying. Aluminium door „save” our money, as we do not have to construct any additional roofing, which also gives us the freedom of spatial arrangement. 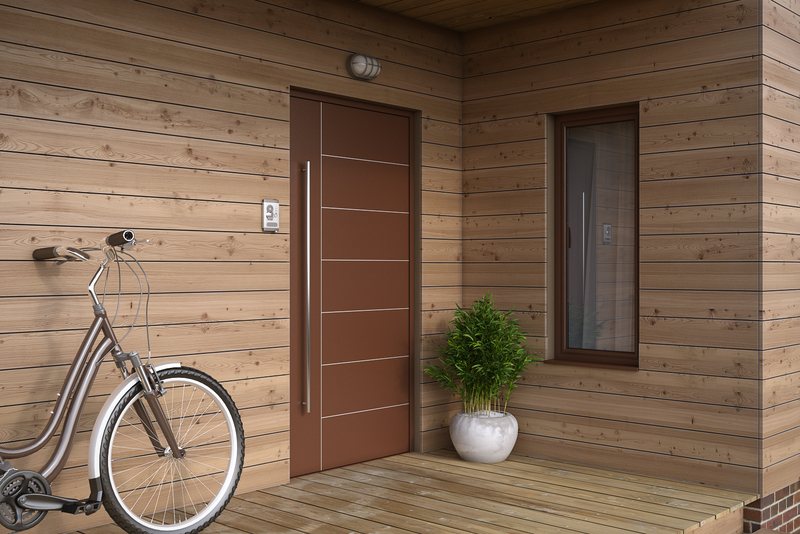 It is very common that the guarantee terms and conditions for wooden door include the provision under which the guarantee is not valid if the leaf is in the distance of less than 100cm from the source of heating in the room, therefore use of floor heating system is not permitted. 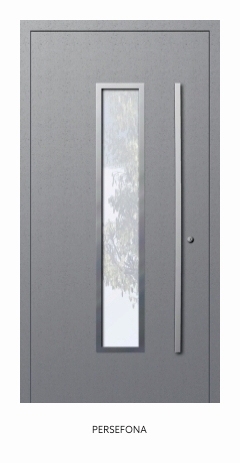 Most efficient functioning of door ensures construction of unheated porch. 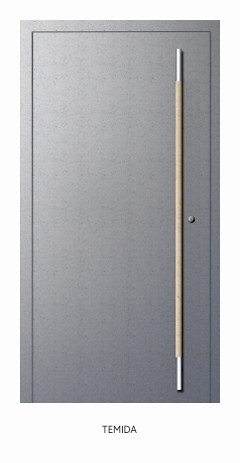 It results from the fact that large temperature differences influencing the inside and external part of the door may result in door deformations influencing their operation and causing loss of tightness or difficulty to close the door. The same is in the case of steel door, however they return to their original form when exposure to heating or cooling ceases. Assembling the aluminium panel door Prestige, we may stop thinking about the impact of heat or cold, and freely select the room heating system according to our preferences. 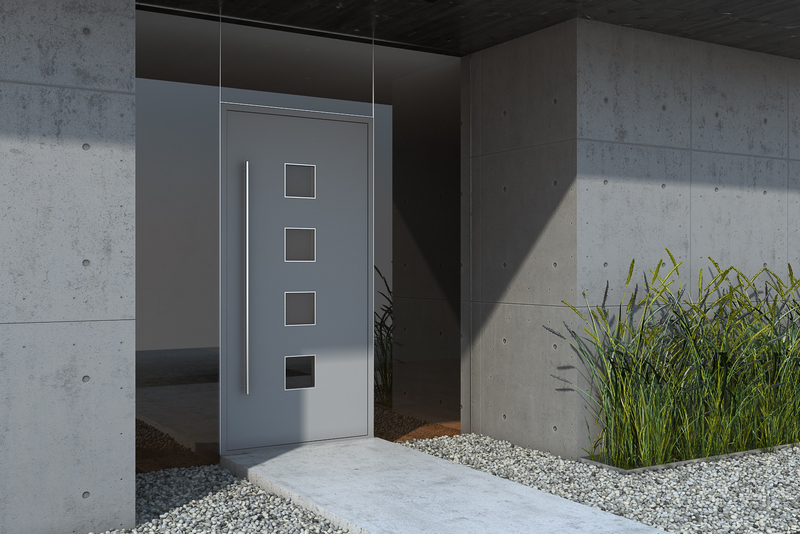 It results from specialist construction of door and use of innovative systems of thermal separators, which has eliminated the effect of door deformation. 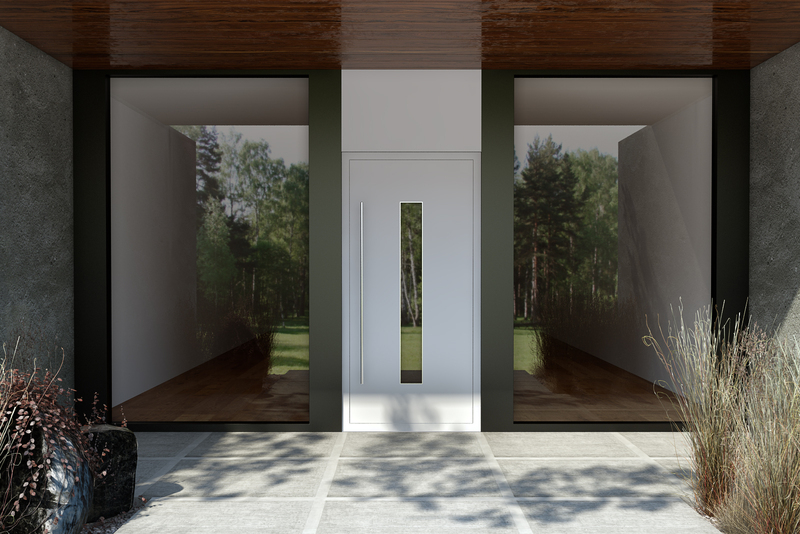 Aluminium door can be assembled at each stage of our house construction, whilst wooden door only after plastering, placing the floors, and drying the rooms, otherwise large humidity will result in door deformations. Intelligent system solutions which allow for access without the necessity to use the key are more and more popular in aluminium door. There are many possible improvements that can be used, such as: sensors making it possible for the householders to open the door with the remote, video modules with service panel responsible for monitoring the situation outside the house, or movement sensors located near the exit. The technical novelty is biometric access system with reader of finger prints, thanks to which we may open the door with the touch of one finger. 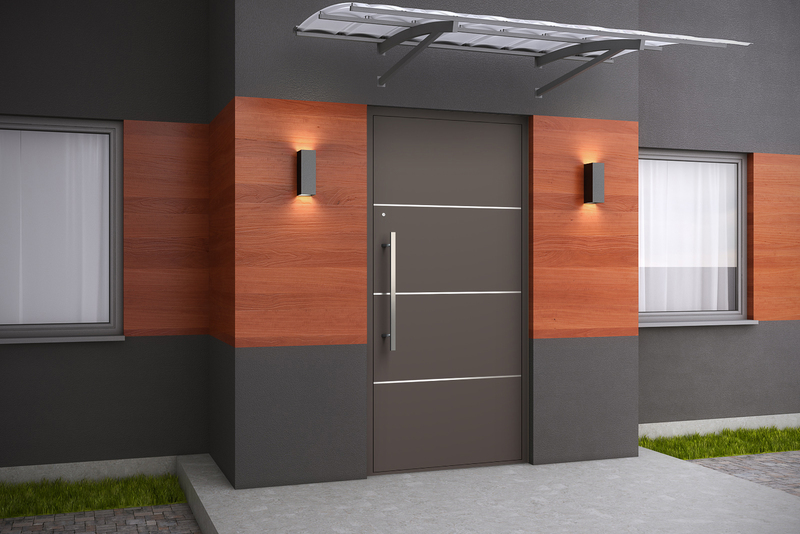 Aluminium door, compared to wooden one, ensures better safety already due to its structure only. It is however possible to enhance the safety adding multi-point espagnolet or anti-burglary bolts assembled form the hinges side. 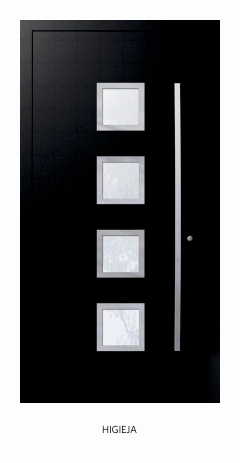 If the door design assumes assembly of glazed elements, they are made of hardened glass. 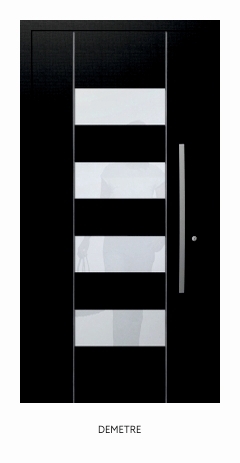 Aluminium door Prestige ensures warmth, safety, and comfort to the householders. Very high level of thermal insulation (Uf from 1.1 W/m2K, Uw from 0.7 W/m2K), acoustic insulation (Rw = 33 Db), and water tightness (class 7A) are achieved thanks to three-chamber structure of the profile, use of the state-to-art thermal separators, and range of internal and external gaskets. 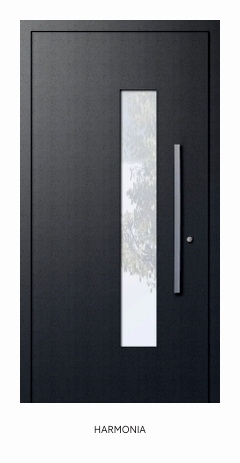 Prestige door, thanks to the environment-friendly and complex structure keep warmth inside during winter, and provide pleasant cold in summer, which translates into lower costs of heating or air conditioning. 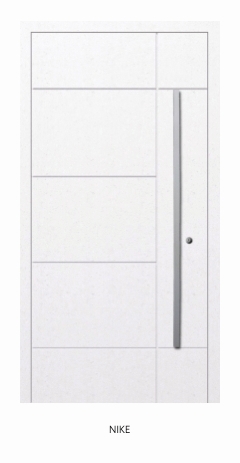 How to take care of handles in aluminium panel doors? Wala uses stainless steel in grade AISI 304 or AISI 316 for production of handles, depending on the customer's order. Those grades are chromium- nickel steel, resistant to water, steam, and changeable weather conditions. The chemical composition and content of elements is different in the steel grades mentioned above, therefore their resistance to corrosion is also different. AISI 316 steel contains an addition of molybdenum, which improves anti-corrosion properties and works perfectly in heavily contaminated or aggressive environment (industrial areas, maritime areas, swimming pools, rooms with high temperatures and humidity). Stainless steel is an easy to clean material, however to make it last for years it is necessary to take care of proper usage and maintenance, this is particularly applicable to 304 grade. It is necessary to avoid strong surfactants (containing chlorides, acids, etc.) as well as sharp cleaning materials that may cause permanent damage of the surface. Improper maintenance or lack of it may also cause occurrence of rust resembling tarnish and discolouration of the product. To remove dirt and deposits without leaving any residue we recommend using special agents dedicated for stainless steel maintenance, e.g. RASKO wool (to remove deposits) and 3M-Stainless Steel Cleaner&Polish foam (for steel maintenance). 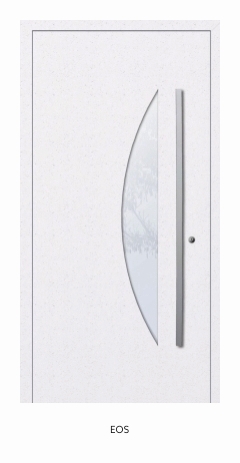 What models of panel door are included in the offer of Yawal? 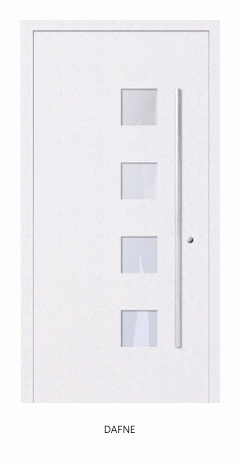 Our offer includes 15 basic models of panel door TM 77HI Prestige, which may be modified customizing them to the customer’s needs. What type of hinges are available in Oknaaluminiowe.pl offer? 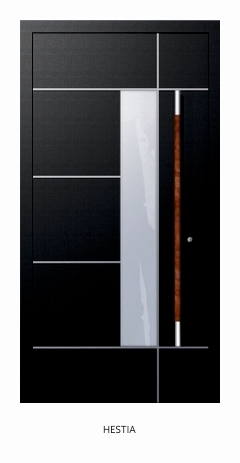 TM 77HI Prestige panel doors are equipped with hinges produced by leading manufacturers of fittings. Well-selected fittings guarantee failure-free operation, safety and attractive visual effect for the users. 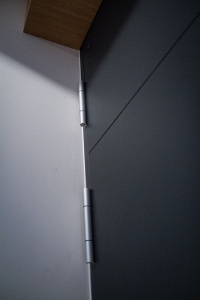 - surface hinges that look beautifully, especially in traditional buildings. I would like my door to be different than others. What can I do to obtain such effect? Customized aluminium door Prestige underline an individual style of each house. 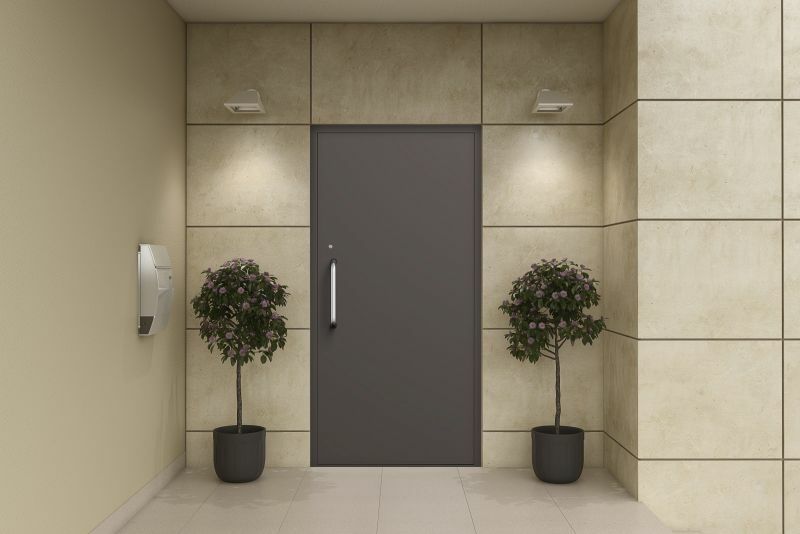 Depending if we search for door to modern building, or to renovated buildings, we may obtain ideally adjusted product thanks to the freedom in choice of the form, colours, structure, and equipment. 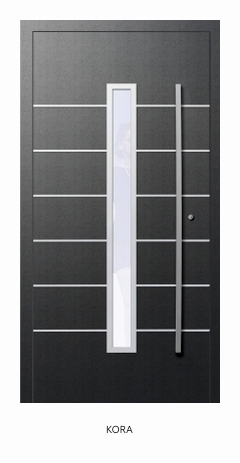 Offer of Yawal consists of 15 models of door, which may be freely configured. Number of variants is almost unlimited, that is why it is worth to take a moment and decide on the correct combination of the door frame, leaf frame, and filling of the door. - rich range of colours. Fans of modern style have the possibility to select between coatings from RAL colour range, anodized surfaces, metallic hue, or structural effect. On the other hand, fans of a cozy, traditional arrangement may choose glazed panels, which imitate the wood. - handles and door pulls, whose designs are going into the direction of simplest shapes. 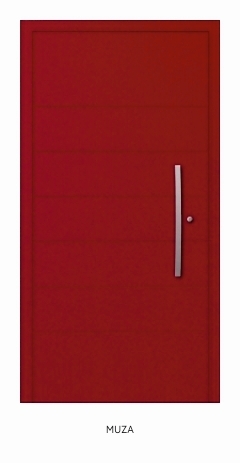 Customized order includes square, rectangular, oval, and round pull door. They are made of stainless steel, plastic, or cast. 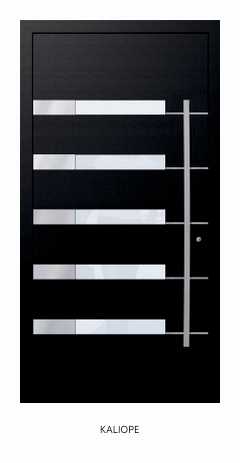 Every door is equipped with internal handle as a standard, which is made of stainless steel, and external pull door made of stainless steel. - locks which ensure safety to users. 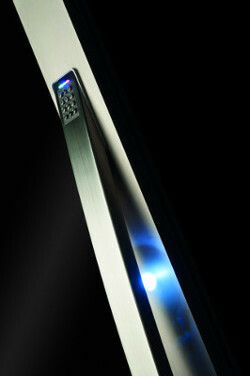 Basic version provides door equipped in three-point locks. Depending on the customer’s needs, it is also possible to assemble anti-burglary locks, equipped in a keyboard, and locks equipped in the state-to-art technique of reading the finger prints. - Decorative applications and mills are made on the door panel under the order thanks to technologically advances production processes. Range of the milling width: from 10 to 60mm. 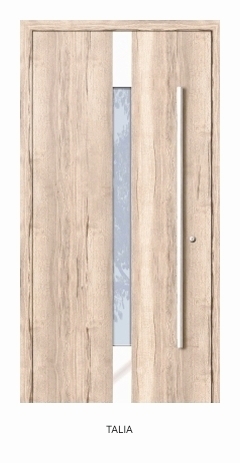 What types of transom/sidelights can be mounted in the panel door? 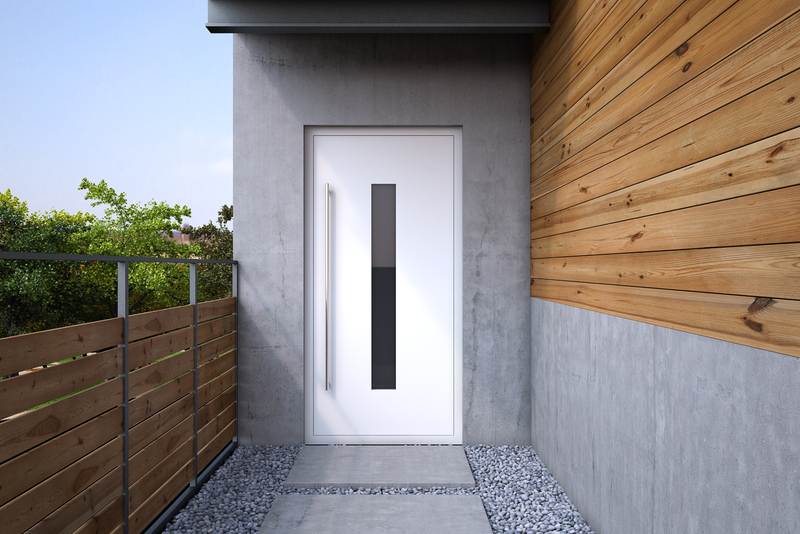 All panel door patterns (single, double, and extended versions) can be equipped with a single sidelight - right or left, and a upper transom. The drawings below present examples of transoms and sidelights made of taped panels.